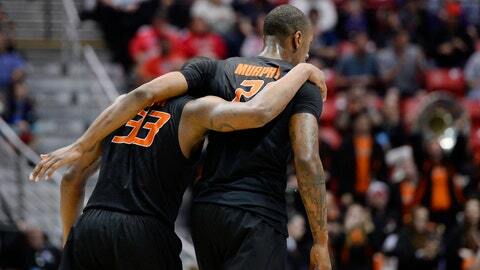 Who had the more disappointing season for Oklahoma State: Football or basketball? It’s about to get quiet in Big 12 country with basketball season over and spring football winding down. Let’s reach into the Mailbag and answer a few questions before the reality of summer sets in. Follow me on Twitter for a chance to make our next edition of the mailbag. Taylor Kohn asks: Do you think that "bag men" are as prevalent in the Big 12 as SEC? Do Texas teams now have to "keep up" since they’re in SEC country? David Ubben: It’s a valid question. I can assure you it goes on in some capacity at nearly every major university that strives to be nationally competitive in football. Awhile back, I had a lengthy conversation with a Big 12 coach about the issue, and he pointed out one major difference between the SEC and the Big 12. In the Big 12–moreso back when we had that conversation–Texas, Oklahoma and Texas A&M were largely the only schools competing for nearly every top prospect in the DFW metroplex and surrounding areas. Texas Tech recruits more heavily in West Texas. The Red Raiders, Baylor, Oklahoma State, Missouri at the time and TCU most often recruit a different level of player in the metroplex. Every now and then, all of those schools will bring in a top guy or two, but most of the time, there’s not a ton of direct competition for the same guys. The SEC is a very different atmosphere in that regard. Look at the SEC map. You basically have about 10 schools in a big circle. The majority of those 10–Ole Miss, Mississippi State, Vanderbilt and perhaps South Carolina excluded–believe they should be competing for national titles on a regular basis. If a coach isn’t chasing after as many five stars as possible, he’s going to infuriate his fan base. They believe they could (perhaps should) sign those guys. Why wouldn’t the ambitious head coach think the same? That leads to a level of competition–some might say desperation–that’s not as prevalent in the Big 12. Texas Tech and the other programs I listed are OK with winning 9-10 games a year. That’s a good year for most Big 12 programs. It’s a great year for some. History has conditioned more fan bases to accept that than to reject it. Texas and Oklahoma are really the only exceptions when you talk about programs who would be displeased with a nine-win season. Plenty of people in and around smaller programs strive for more, but they don’t EXPECT it. Meanwhile, try telling Georgia and Tennessee fans some time they shouldn’t expect to win national titles. Tell me how that goes. There’s your difference in the climate of the Big 12 and the SEC and why, though I bet bag men do show up in this state, they’re not quite as ingrained in the culture across Texas as they are in SEC country. Eric Williams asks: More disappointing outcome – OSU’s football season or OSU’s men’s basketball season? David Ubben: No contest: Basketball by a mile. OSU may have been the Big 12 favorite in football, but they were far from a juggernaut and narrowly entered the season as the most talented team in the league. They lacked a true star and like I wrote plenty of times, were the favorite just because they were good at everything and didn’t have a true, glaring weakness. When Kansas is in your league, the bar for a Big 12 title is a lot higher, so falling short of that goal isn’t that big of a disappointment. However, to go 8-10 in Big 12 play and get a lower seed than the previous year with Marcus Smart, Markel Brown and Le’Bryan Nash is inexcusable. You also have to factor in the amount of negative press this team generated. No team in college basketball history had a) a player push a fan and b) a player urinate out the window of a moving car. That’s as impressive on a historical scale as it is infuriating for Travis Ford. Mike Gundy’s team has almost 10x the players Travis Ford’s does and the football team didn’t have an incident even close to that level and came within a play of winning the Big 12. Advantage, football. This year was a moderate disappointment there. Basketball was a massive underachiever and turned what could have been a Final Four season into one of the most disappointing years in recent history around Stillwater. Don Kersting asks: I see OU and Baylor in a recently released preseason Top 10 poll. Are both deserving of the spot? David Ubben: I’m on board with Oklahoma as a top 10 team, but that feels high for Baylor. Baylor having an insane offense is nothing new. It won 6-9 games with a great offense under Briles before they turned the corner in 2013. Last year, the difference was the defense. Baylor’s a borderline top 15 team for me because I have a hard time believing they can lose six starters from last year’s defense and still lead the Big 12 in yards per play. The defense will be solid with returners like Shawn Oakman, Bryce Hager and Terrell Burt, but fielding a solid secondary with three first-year starters in a league full of experienced quarterbacks is asking a lot. It’s asking too much to buy into the Bears as a top 10 team, at least in the preseason. Maybe the young guys like Orion Stewart and Xavien Howard will surprise me. Jack asks: Sleeper star on this years OSU team (basketball or football, take your pick)? David Ubben: With all the hype he’s getting, Tyreek Hill is ineligible for this, so I’ll go with the speedy redshirt freshman, Ra’Shaad Samples. He’d probably be helped out a lot if Mason Rudolph beat out J.W. Walsh to start at QB, but even if Walsh maintains his starter status, Samples can be a guy who replaces Josh Stewart on some of those throws over the middle that Walsh loved to send Stewart’s way. OSU’s depth at receiver last year gave him the luxury of just learning in Year 1, but he’s the son of a great coach in Skyline’s Reggie Samples and OC Mike Yurcich had very good things to say about him the last time we spoke. Ross Eveland asks: Paul Rhoads, anywhere close to a hot seat? And are you ever going to make it to Ames? David Ubben: I get this question more than you could ever imagine. Folks … no. Not even close. Not happening any time soon. Iowa State is not Texas. Rhoads was the first Iowa State coach to ever reach a bowl game in three of his first four seasons. One disappointing 3-9 season is not going to erase the reality that Iowa State signed him to a 10-year deal back in 2012. Rhoads may leave eventually, but he’s had opportunities since he’s been at ISU and hasn’t left. He loves Iowa and grew up right by Ames. He’s one of a handful of coaches on the planet who doesn’t view ISU as a pure stepping stone job. You invest long term in that. ISU has. If the Cyclones miss a bowl game in the next two seasons (and don’t come close), he may be in a little bit of hot water, but right now, his seat is ice cold. As for my trip to Ames, it all comes down to whether or not ISU can win enough to warrant it. I don’t do charity when it comes to program coverage. Michael Darmitzel asks: Could the Big 12 field two top 10 defenses in the nation next year? Oklahoma and TCU? David Ubben: Last year, with all the new quarterbacks in the league, defenses struck back a bit in a league known for offense. Baylor, Oklahoma State and TCU all finished in the top 13 nationally in yards per play. The pendulum’s swinging back the offense’s way this year with so many returning passers. TCU and OU are the most likely candidates. I’d keep an eye out for Texas, too. The Big 12 ends the year with zero teams in the national top 10 in yards per play. Clonesjer asks: have you ever ordered a rueben at a deli and had the say "rueben for ubben, order ready" ? David Ubben: You’re one of the 70 percent, I see. I’d say about 70 percent of folks who don’t actually know me pronounce my name with a long u at the beginning, like "tube." It’s actually a short u, like "rub." So really, even if reuben’s weren’t disgusting and I somehow decided to order one, the comedic value would probably be lost if they called out my name. Scott Koch asks: Do you see conference realignment settling for a while or are you hearing (legitimate) rumbles still? David Ubben: At least around the Big 12, it sounds pretty settled. I asked around a little bit at the Final Four last week and there doesn’t seem to be much interest in really having any kind of conversation to explore the possibility. Most of that is because of a lack of quality candidates, but the Big 12’s members have been very satisfied with the increased paychecks and round-robin scheduling that the 10-team configuration has provided.